Every once in a while you take a gamble on a new product - and every once in a while, your gamble pays off! My 9 year old (though she has known how to tie her shoelaces for years) always seemed to be walking around dragging untied laces through the mud and the muck. Besides being a tripping hazard at school, the laces were getting wet and grimy and who in their right might wants to touch soggy cold shoe laces all the time? Yuck. Enter in Hickies. I had seen an ad for them on Facebook and they had really good reviews. Since I had nothing to lose I thought I would give them a whirl. *By the way, I am not being paid or reimbursed for this product. We bought them and are giving an honest review. So here is a typical look for my nine-year-old. Totally put together and color coordinated everywhere, with her shoelaces a draggin' in the wind. Sigh. Seriously, like all. The. Time. 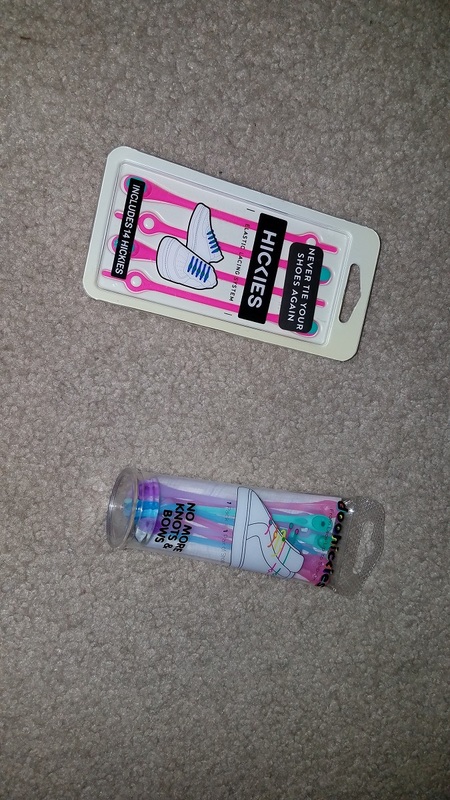 The Hickies are an elastic, stretchy, easy to clip on alternative to shoe laces. They come in many colors and styles. We choose some hot pink ones, because she loved the color combo of teal and hot pink. We also bought some pastel ones as a back up which my other daughter is claiming shortly. Hickies come in many shades and styles! 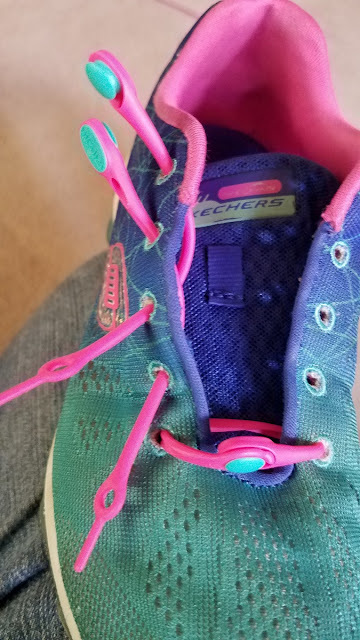 First thing we did was to remove the old laces... Good bye and good riddance! Next we laid out all of the Hickies. 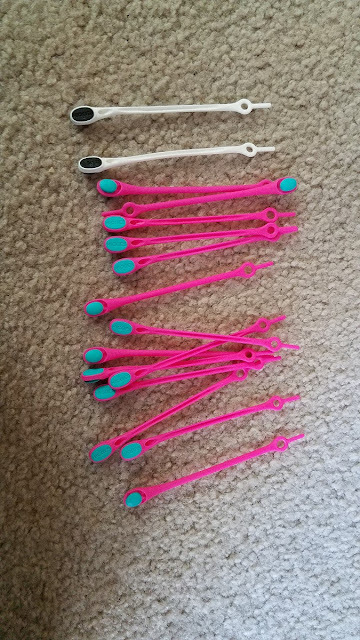 They came with 14 Hickies plus two bonus black and white ones, in case you want to add in some contrast. Super cute and we liked we could color coordinate with the existing shoe colors. 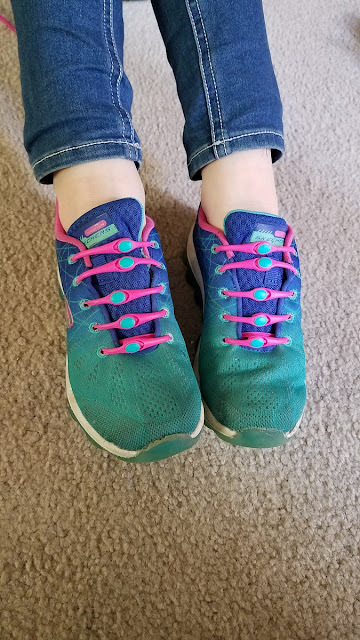 There are many ways to lace up to give you different comfort levels. 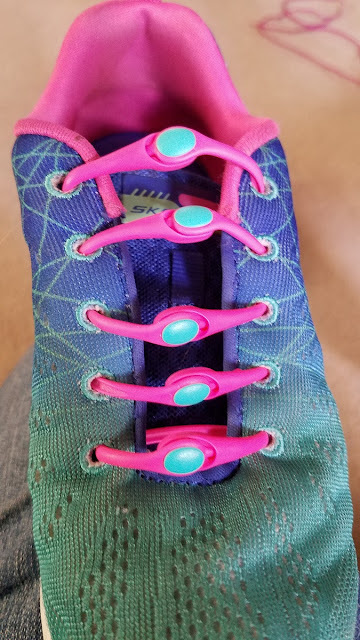 I will put a link here, they have many videos on different methods to make them snug or easy to slip on. 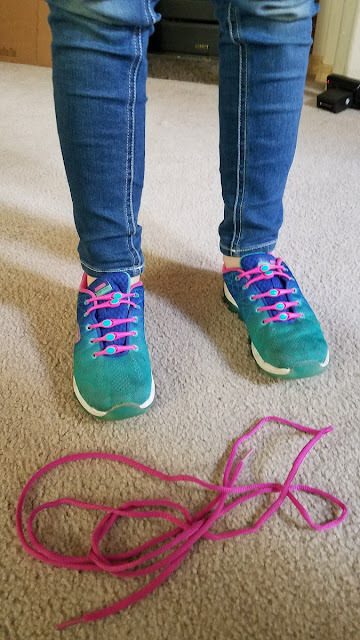 We ended up doing a little looser style, so she could easily get them on and off in the morning for school, and yet they would stay snug on her feet all day. The first one we ran straight across the bottom of the tongue. It is the only one we did straight across. Next we worked on one side alone. 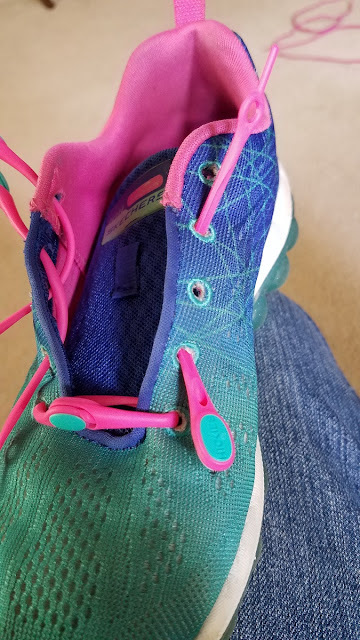 Place the "tail" of the Hickie through the top hole on the shoe, and then skip one hole. 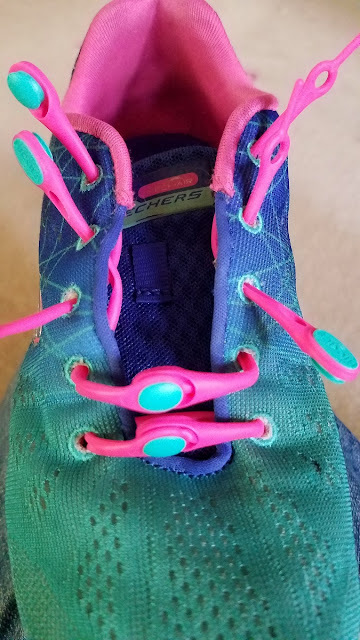 Have the Hickie come out of hole after the skipped one like this: The head should be at the top, tail out the same side after skipping one hole. You want to repeat this action starting with the second hold down. Skip the one with the first Hickie in it and push it out the remaining hole. So now you have two Hickies on the same side, two heads at the top two holes, tow tails at the bottom two holes. Now repeat this on the other side of the shoe, only do the opposite and start at the bottom of the shoe. The head will go in the bottom hole, the tail will skip one hole and come out the third hole. The the second Hickie will go in head first at the second to the bottom, with the tail coming out the top hole. The final product should look like this before you attach them all. 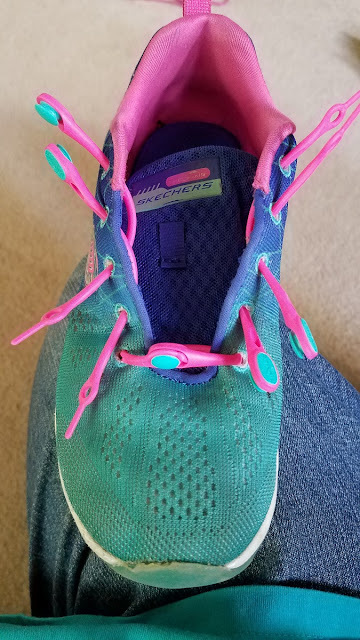 Now that you have that worked out, all the Hickies will line up as you connect them across the tongue of the shoe. 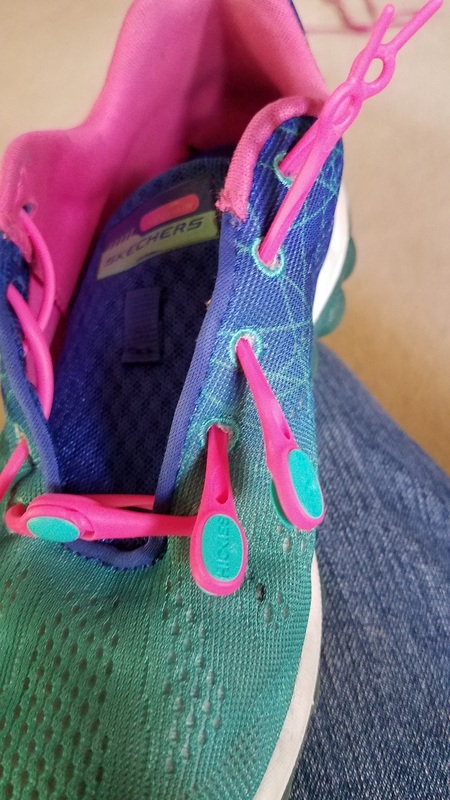 This looser method allows you to slip on the shoe easily, but stays on all day. 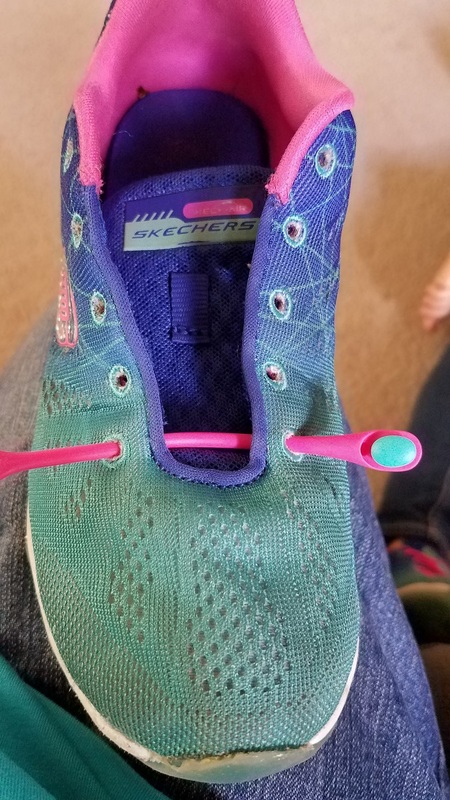 Do the same thing to the other shoe and you will be in business. 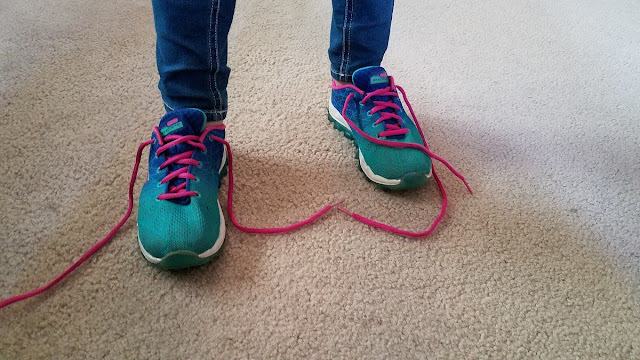 She slipped these right on and started running around the house. She also believes that Hickies make you run faster! 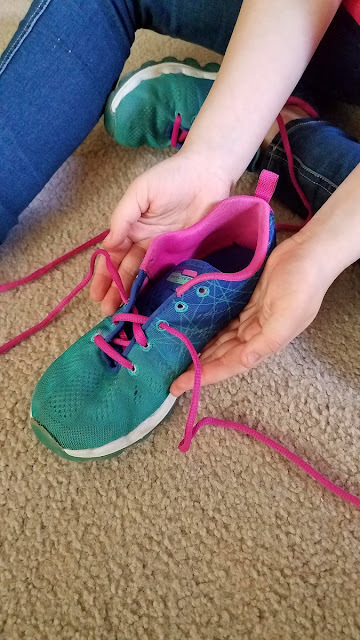 Good bye sad soggy shoe laces... we are embracing the very easy shoe future! No more trip hazard and new fashionable Hickies to boot. 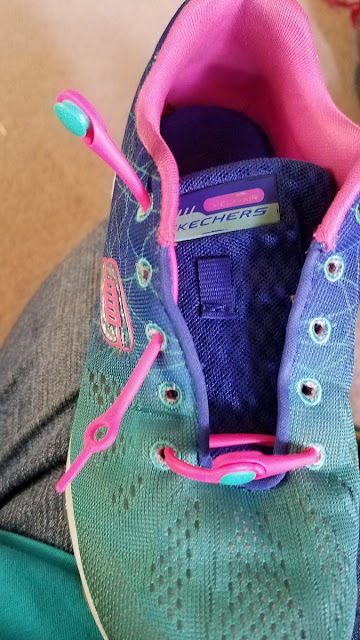 By the way, they don't just make Hickies for kids. There are tons of adult uses, running shoes, sports shoes, work shoes. It's a great way to make any pair of shoes easy to get into, fit snugly, and look pretty fabulous while doing it.